Most California county and city building departments require a building permit for the installation of a whole house fan. Many fan companies do not obtain permits for whole house fans. Why? Their fans no longer meet the standards for energy efficiency- they are poorly constructed, have minimal warranties and are not properly sealed. Their fans simply do not work efficiently. Non-permitted fans are subject to applicable fines. Call your local buliding department and verify if their fan can be installed. Permits can range from $50 to $200 depending on where you live. To find out which countertop materials last and which don’t, Consumer Reports stained, sliced, scratched, scorched, and nicked 16 materials from leading brands. Except for recycled glass, there was little difference among competing brands of each material. That’s why we rate materials, not brands. When you shop, pick the material, then get the brand that offers the color or pattern you prefer at the best price. Here are more shopping tips from our experts. Think big. Tiny samples make it difficult to visualize what the material will look like in your kitchen. 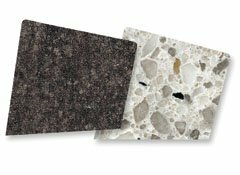 Though you’ll want to play with online design tools, such as the ones at DuPont, Lowe’s, and Silestone, always see the materials in person and take home large samples, even if you have to pay for them. Mix materials. There’s no rule that says all of your counters need to be the same. Save money by using pricey materials on visually prominent areas such as the island or peninsula and less expensive materials on the perimeter. Or consider buying a remnant if your island or counter area is small. Get an edge. Rounded edges on stone counters are less likely to chip. Straight and beveled edges give a modern look, and an S-shaped ogee curve offers a traditional feel. Add an ogee or bullnose edge to laminate counters, and that unappealing dark line disappears. Certain edges add cost, so ask. Wander the stone yard. Natural stone’s color and veining can vary widely even within a slab, so if you find the slab you like, reserve it. Otherwise it might be gone when you return. Be precise. Have the fabricator take final measurements, making accuracy his responsibility. Insist that the estimate and contract specify the material’s thickness and finish, and fees for cutouts for sink, faucets, and cooktop, edge treatments, and cost of the backsplash and removal of old counters. Factor in finishes. Granite and quartz are sold with polished or matte finishes. In our tests both finishes were about the same at resisting stains that were left to dry overnight. Granites with proprietary sealers, such as Stonemark, performed no better than regular granite. There were real differences in butcher block depending on the sealer used. Matte and random grain finishes conceal scratches better on stainless-steel counters than on polished ones, but fingerprints are a given. In our countertop tests, quartz withstood almost everything—stains, hot pots, abrasive pads, and knives—and unlike granite, it doesn’t need to be resealed. Its combination of beauty, durability, and easy maintenance makes it a great choice for busy kitchens. Granite performed almost as well. Both materials are a bit pricey. Laminate is still the budget-friendly choice. Its looks have improved, thanks to better printing. But those aren’t your only countertop options. See our full countertop Ratings and recommendations. Video: Josh Temple, a licensed contractor and host of HGTV’s popular show “Flipping the Block,” joins TODAY to reveals some construction tips that’ll help you save money.